Germany, the birthplace of the modern automobile, has long held quite a bit of power in the car world. In fact, 80 percent of all luxury vehicles sold globally are from German brands. It wasn’t that long ago Volkswagen boasted in all of its ads of the German engineering that goes into its vehicles. If you haven’t noticed, the auto industry is in a bit of a transformational moment, if by “bit” I mean a complete overturning of pretty much everything. This shakeup is making German automakers nervous. How they’re reacting to someone moving their cheese is pretty interesting. No doubt, which survive and in what forms will depend on what each one is doing or not doing now. If Angela Merkel isn’t sweating more than when Putin’s dog was in the room, I’d be surprised. No industry in Germany is bigger than cars. 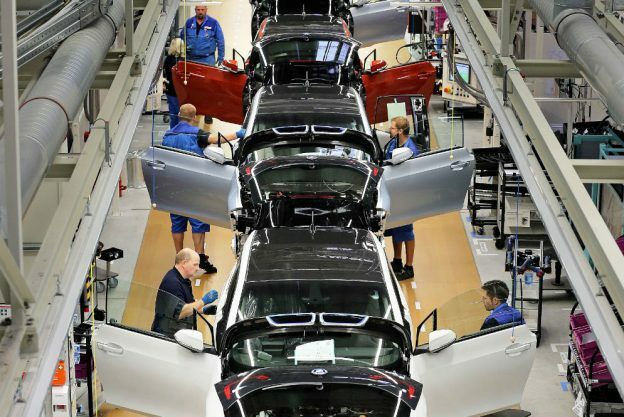 Twenty percent of imports are cars, so to have even a small drop in production would trigger an economic wave that might make the nation more like country’s it so quickly has criticized as members of the EU. A fall in German car production seems imminent at this point, with even the strong IG Metall workers union predicting it’s coming. Just how bad it will be remains to be seen. Some predict the floor will fall out quickly, others think it will happen slowly, while some economists believe German automakers will rebound. One of the reasons for weakening car manufacturing is the car-sharing phenomena. This takes many shapes and we don’t know the long-term effects of these services, to be honest. Services where you use an app to access a communal car, whether on the fly or scheduling it in advance, arguably doesn’t carve that much out of private vehicle ownership. Many who subscribe to such a service live in dense urban centers where owning a car is rare anyway, since such an arrangement makes sense for them. There are others who just don’t want to own a car. Some automakers are trying to adapt to this shift, but analysts see this as yet another threat to the Germans. Then there are the ride-hailing services like Uber and Lyft. While some people use them instead of buying a car, it’s admittedly an expensive way to get around, especially if you travel a lot. Just how many people will continue to use the services in the long term is difficult to foresee. In addition, all those people driving for the services are racking up plenty of miles, not to mention wear and tear, on their ride. That, in turn, will push them to either abandon the gig or to buy a new car, which could provide at least somewhat of an uplift for the auto industry. The fact is fully-electric cars are less complicated. That means fewer parts to break and less servicing, but it also reduces the number of people needed to assemble vehicles in factories. Even worse, the 75,000 Germans working in engine and transmission facilities are looking at a tremendous workforce reduction. Just how quickly these auto assembly jobs disappear depends on how quickly electrification will sweep the industry. Some have been predicting mass adoption in only a few years for the past several years, while others think it won’t happen until 2030 or later. That’s not the end of what’s ailing the German auto industry. Brexit, or the exit of Britain from the European Union, is also putting German automakers at risk. At the writing of this post-Brexit has been delayed, but completely avoiding it seems impossible. Analysts say Brexit could slash over 100,000 jobs from automotive facilities in various regions of Germany. That’s significant, considering over 800,000 Germans work in the industry. Volkswagen and BMW stand to lose the most in this scenario. This sounds bleak, but the reality might not be so bad. Economists’ predictions are based on vehicle imports from the European Union to Britain fall by 25 percent thanks to no negotiated trade agreement between the two governments. Will that actually happen? Nobody knows. Even worse, if it does, we’re not entirely sure about the real-life impact. As my Economics professor would say, four economists in a room, ten different opinions. There are just too many variables to accurately predict the future. Few automakers share the level of animosity towards one another than BMW and Mercedes. These two routinely take out ads and pull stunts in Germany to make fun of each other, and it’s usually not in good fun. Think of a bitter sports rivalry between teams which are based in the same region and you’ve nailed the level of vitriol. But hard times call for extreme measures, even if it’s partnering with your enemy. This is why BMW and Mercedes recently announced they’re working on co-developing vehicle platforms, something that just a few years ago would’ve been blown off as an obvious joke. The cars they would be creating an architecture for would be the 1 Series and A-Class. Both are compact near-luxury models which don’t generate much revenue per car sold. It’s a sign that both German automakers are feeling the financial pinch. Before you think that’s the end of the BMW-Mercedes romance, there’s more. These two are going to pool car sharing services, city mapping resources, and even source the same batteries for electric cars from suppliers for a big pricing discount. Naturally, the big concern is that the BMW 1 Series and Mercedes A-Class drive differently. Considering BMW just created a sports car in collaboration with Toyota, all this hand-wringing is probably for nothing. Predicting the future, especially economically, is tricky. No matter how you slice it, things still don’t look good for the German auto industry, unless some unpredictable variables have an effect soon. If you find this article interesting, you will enjoy this this blog on Porsche and Lean Manufacturing.